Words by Paul Fontaine. Photo by Alísa Kalyanova. Originally published in The Reykjavík Grapevine. One of Iceland’s proudest assets is its energy grid. Geothermal energy, by 2010 figures, accounts for just over 26% of the country’s electricity, as well as 86% of its heating and hot water. Iceland’s geothermal energy technology has been shared with countries around the world, and has attracted the interests of foreign investors. However, as comparatively cleaner for the environment geothermal power is not without its problems. One of these is the main elephant in the room: geothermal energy is not a renewable energy source. Boreholes that tap into the massive steam vents below the surface do not last forever. When Ross Beaty, CEO of Magma Energy (now a part of Alterra Power Corp.) made the specious claim that geothermal energy lasts for centuries, scientists such as Stefán Arnórsson and Sigmundur Einarsson were quick to point out that geothermal power in the Reykjanes area — where Magma sought to drill — only had enough power to last about 60 years at best. Although this point was seldom, if ever, brought up in any previous discussion about geothermal power in Iceland, more recent events have shown that geothermal energy is not just non-renewable; it can even pollute. First of all, the steam that geothermal energy taps does release a number of harmful emissions. The International Geothermal Association released a report in 2002 showing that these emissions can include carbon dioxide, hydrogen sulfide, methane and ammonia. These emissions are linked to global warming, and can do extensive environmental damage. Even the water itself can be poisonous — the scientific journal Environmental Contamination Toxicology published a study in 1997 which showed that waste water can contain chemicals such as mercury, arsenic and boron. 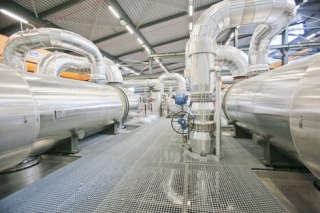 In order to reduce the amount of pollutants that geothermal power produces, it is necessary to take a number of precautions, such as recycling the steam through a series of compressors and pumps. The waste water needs to be channelled deep back into the ground, to prevent it from poisoning drinking water tables. Both of these precautions were outlined in the 2007 scholarly article ‘Strategic GHG reduction through the use of ground source heat pump technology’. This last point has been the centrepiece of the controversy surrounding one such plant in Iceland, Hellisheiðarvirkjun. The largest power plant in Iceland — and slated to be the largest in the world once it reaches its full capacity — it is located in the geologically active Hengill area of southwest Iceland, comprised primarily of a chain of three volcanoes. The up-side of this is that a tremendous amount of power can be generated here: the plant estimates 400 megawatts will be reached once the two additional turbines added earlier this month as in full swing. The down-side is: geological activity means earthquakes. The sheer amount of geological activity in the area cannot be underemphasised. Hundreds of tremors were reported in the Hengill area on a single day last September, and concerns were immediately raised that these tremors — some of them measuring 3 or higher on the Richter scale — could do damage to the pipeline that pumps waste water back into the ground, below drinking water tables. Steinunn Jakobsdóttir of the National Weather Service told Stöð 2 news at the time that larger quakes could not be ruled out. The plant itself had already been targeted by environmentalists as damaging to the environment, from a developmental standpoint, with Saving Iceland trying to bring attention to the plant’s overall effects on the landscape. The notion that poisonous waste water could be broken free from pipes, and spilled into drinking water, turned the dial up on the anxiety. NOTHING CAN POSSIBLY GO WRONG! But research done on the drilling does not necessarily support Bjarni’s claim. An environmental assessment conducted on the plant in 2006 by the South Iceland Health Supervisory Authority arrived at the conclusion that they “put a great deal of emphasis on closing the construction of the waste water disposal system and the area used to dispose of the water,” meaning that the area itself for pumping waste water back into the ground was far from ideal. Research conducted by the nearby municipality of Ölfus in March of this year concluded that there were not enough controls in place to even be able to handle the regular amount of waste water being produced under normal circumstances. Despite these warnings, construction steamed ahead, and any criticism of waste water polluting drinking water was dismissed as alarmist. That is, until it was discovered that that’s exactly what happened. Only weeks ago, it was discovered that Hellisheiðarvirkjun had been pumping waste water containing hydrogen sulphide into drinking water tables, on and off, for two years. The reason? Before a new waste water borehole was completed last September, another one at the Gráuhnjúkar area had been used instead. This borehole did not have the capacity to deal with the amount of waste water it had to contend with, and so it released it, through a valve intended only for emergencies, into the drinking water tables. Residents of nearby Hveragerði were less than pleased with this news, and called a town meeting demanding an explanation. They have been assured by Orkuveita Reykjavíkur that with the new waste water borehole in place, this practice will not continue. They also emphasised that their scientists do not believe the pumping of waste water into the ground will increase the risk of earthquakes. No mentions were made, however, on how well these pipes could hold up in the event of a strong enough quake — and strong earthquakes are not exactly uncommon to the area. If geothermal power — Iceland’s crown jewel of green energy — is neither sustainable nor non-polluting, does this mean we need to turn exclusively to hydropower, which comprises the remainder of the country’s power source? What about oil, which is believed to lie beneath the seabed in Drekasvæði, the northern corner of Icelandic fishing waters? There might not actually be a dichotomy at all — other green resources may exist. While Iceland is far from ideal when it comes to solar energy, and wave power is still proving to be both expensive to build and maintain, anyone who has ever visited the country can attest that if there is one thing Iceland has plenty of, it’s wind. A research group assembled by Landsvirkjun in 2010, working in conjunction with Icewind — a pan-Scandinavian team looking to develop wind power in the Nordic countries — has concluded that wind power is a very realistic option for Iceland. They believe that building wind turbines in the southwest would be the best option. In fact, just last July Icelander Haraldur Magnússon successfully raised a 30 KW windmill on top of Hafnarfjall mountain, which immediately went into operation. MP Mörður Árnason — who is also the chairperson of the National Energy Authority Research Fund — believes that while figures do not seem to indicate that wind power is a competitive option at the moment, that it would be hasty to dismiss the option altogether. Indeed, there are many vast, uninhabited and perpetually windy areas in Iceland, particularly in the Highlands, which would make ideal grounds for a wind farm. Whether the Icelandic government devotes more time and energy into exploring wind power remains to be seen. In the meantime, Hellisheiðarvirkjun is inadvertently repeating the point that geothermal power is not as green as it seems, and that it may be time for Iceland to put its pride and joy to rest. Saving Iceland’s Increased Sulphur Pollution in Reykjavík Due to Geothermal Expansion in Hellisheiði. Miriam Rose’s and Jaap Krater’s Development of Iceland’s Geothermal Energy for Aluminium Production – Download as PDF. Anna Andersen’s Reykjavík Energy in Deep Water: The Untold Story of Geothermal Energy in Iceland. hi there! this is very interesting. back here in the philippines, in the province of Negros Oriental, an energy company has been doing geothermal expansion projects in our last remaining natural forest and also our critical watershed. we are currently submitting a petition opposing the 2nd expansion project.